Download "Accident Compensation (Financial Responsibility and Transparency) Amendment Bill"
3 Explanatory note Accident Compensation (Financial Responsibility and 3 by Order in Council. This is because flexibility is needed as to when these provisions are repealed. Clause 3 provides that this Act amends the Accident Compensation Act 2001 (the principal Act). 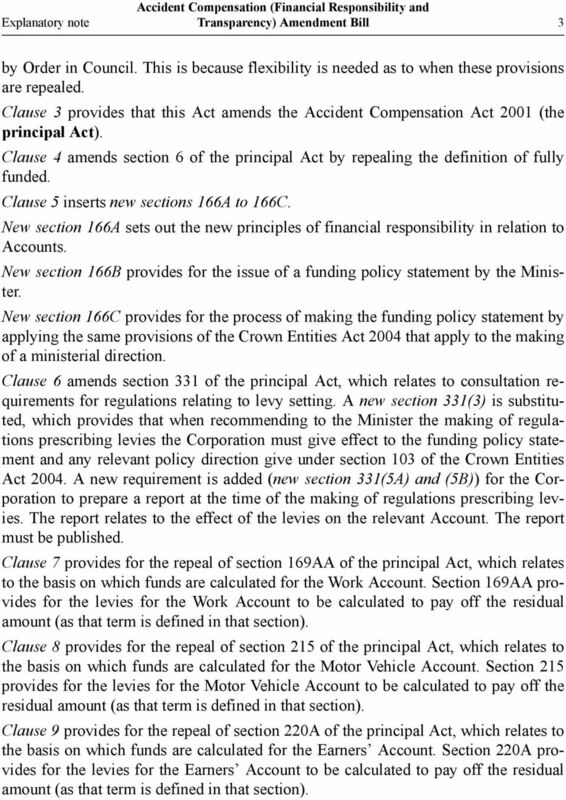 Clause 4 amends section 6 of the principal Act by repealing the definition of fully funded. Clause 5 inserts new sections 166A to 166C. New section 166A sets out the new principles of financial responsibility in relation to Accounts. 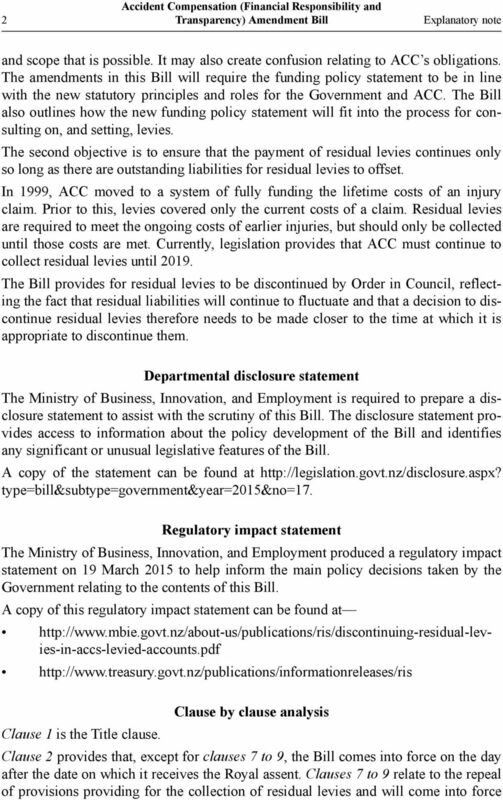 New section 166B provides for the issue of a funding policy statement by the Minister. 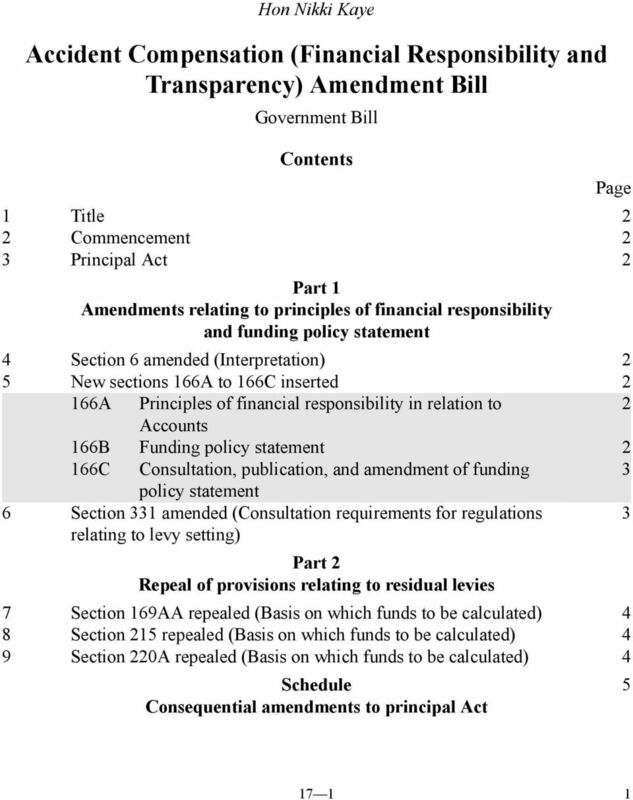 New section 166C provides for the process of making the funding policy statement by applying the same provisions of the Crown Entities Act 2004 that apply to the making of a ministerial direction. Clause 6 amends section 331 of the principal Act, which relates to consultation requirements for regulations relating to levy setting. 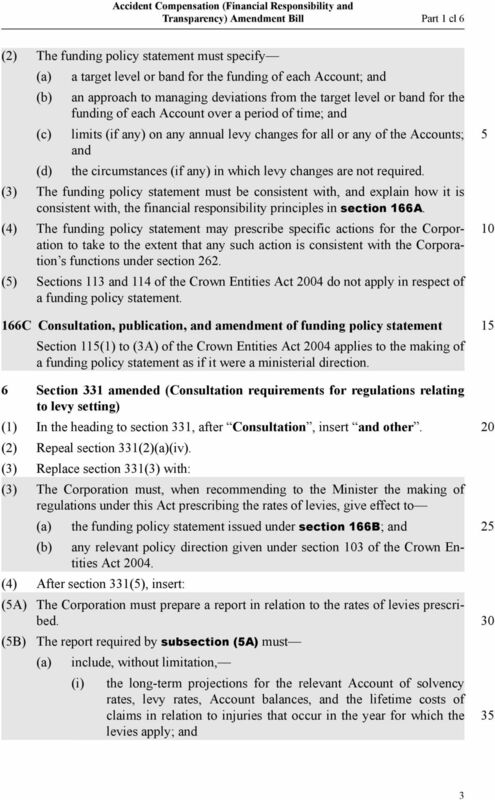 A new section 331(3) is substituted, which provides that when recommending to the Minister the making of regulations prescribing levies the Corporation must give effect to the funding policy statement and any relevant policy direction give under section 103 of the Crown Entities Act A new requirement is added (new section 331(5A) and (5B)) for the Corporation to prepare a report at the time of the making of regulations prescribing levies. 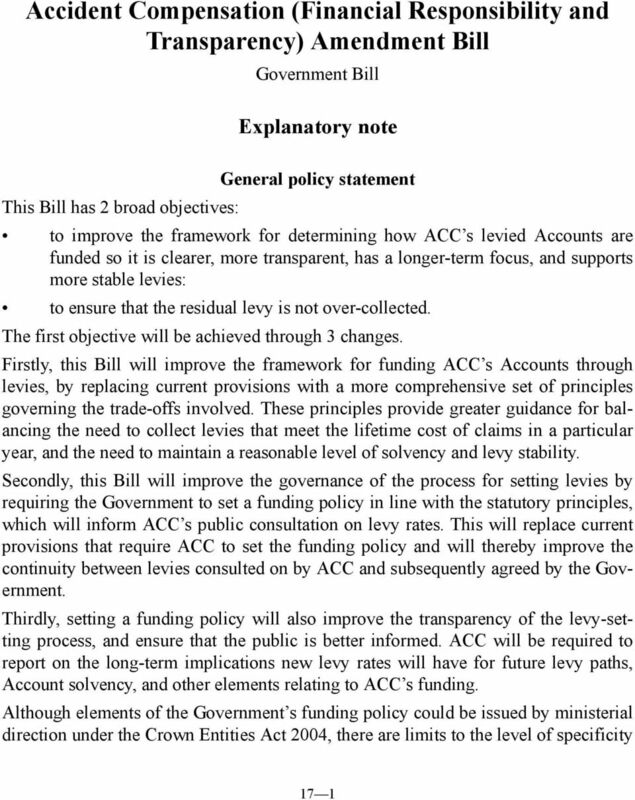 The report relates to the effect of the levies on the relevant Account. The report must be published. 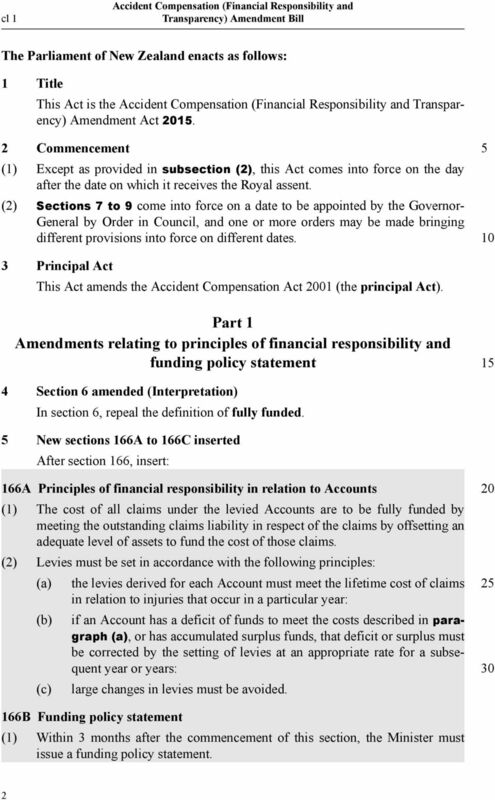 Clause 7 provides for the repeal of section 169AA of the principal Act, which relates to the basis on which funds are calculated for the Work Account. 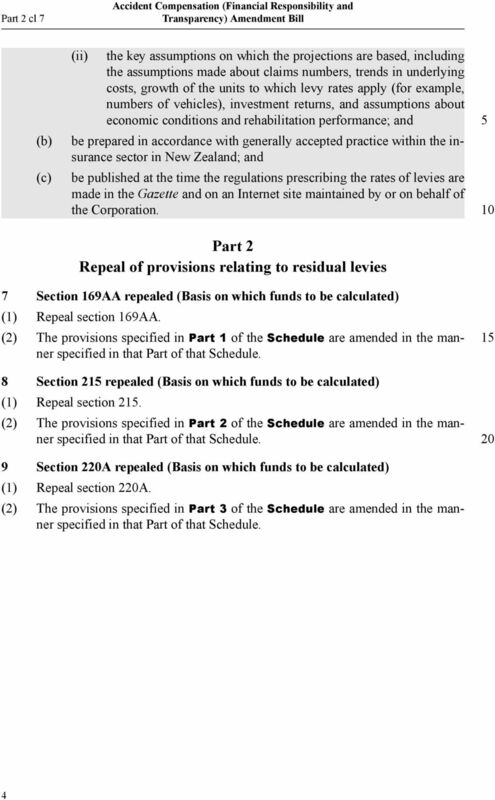 Section 169AA provides for the levies for the Work Account to be calculated to pay off the residual amount (as that term is defined in that section). Clause 8 provides for the repeal of section 215 of the principal Act, which relates to the basis on which funds are calculated for the Motor Vehicle Account. 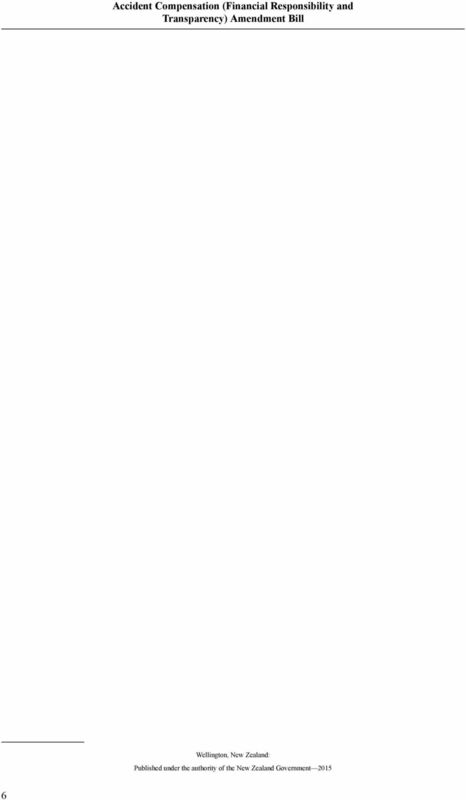 Section 215 provides for the levies for the Motor Vehicle Account to be calculated to pay off the residual amount (as that term is defined in that section). 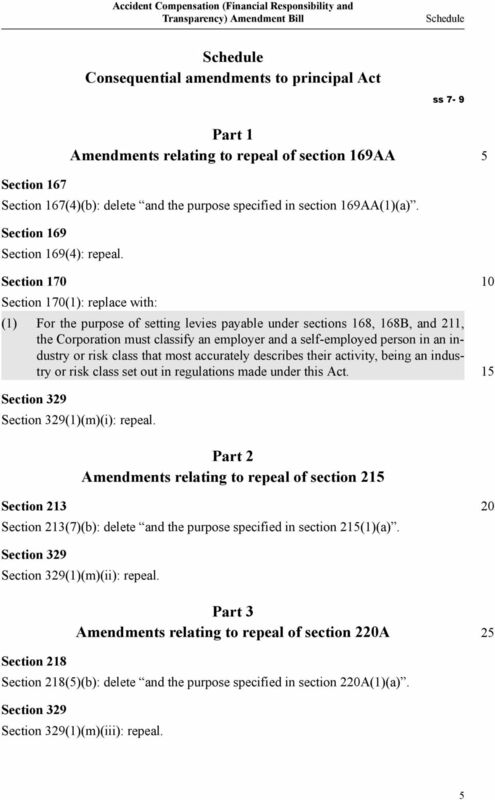 Clause 9 provides for the repeal of section 220A of the principal Act, which relates to the basis on which funds are calculated for the Earners Account. Section 220A provides for the levies for the Earners Account to be calculated to pay off the residual amount (as that term is defined in that section). THE PARLIAMENT OF THE COMMONWEALTH HOUSE OF REPRESENTATIVES (CONSEQUENTIAL PROVISIONS) BILL 1987 EXPLANATORY MEMORANDUM. the Hon P.J. Superannuation Legislation Amendment (Reform of Self Managed Superannuation Funds Supervisory Levy Arrangements) Bill 2013 No. PUBLIC ACCOUNTANTS REGISTRATION (REPEAL AND AMENDMENT) ACT 1989 No. 34 NEW SOUTH WALES TABLE OF PROVISIONS 1. Short title 2. Commencement 3. Repeal of Public Accountants Registration Act 1945 No. 18 4. Bill 122. An Act to amend the Act respecting the Société de l assurance automobile du Québec and other legislative provisions.